Sri Lanka 4-570 and 1-116 (Tillakaratne Dilshan 63*, Kumar Sangakkara 49*, Shahadat Hossain 1-18) leads Bangladesh 638 (Mushfiqur Rahim 200, Mohammad Ashraful 190, Nasir Hossain 100, Nuwan Kulasekara 2-94) by 48 runs. It was the first time ever that the Bengal Tigers powered 638 runs in their history of the longer version of the game. Mushfiqur Rahim became the first cricketer and skipper of the country to hammer a double hundred in Test cricket. Sri Lanka declared their first innings at 4-570 after utilizing 135 overs and scored 116 for the loss of one wicket after 30 overs in the second. Bangladesh piled up 638 runs before they were bowled out in 196 overs. The fourth day’s play concluded on Monday, March 11, 2013, at Galle International Stadium. Earlier, the Bengal Tigers started the day at 4-438 in 136 overs, Mohammad Ashraful and Mushfiqur Rahim were unbeaten at 189 and 152 respectively. The first added just one run to his overnight score when he was caught by Angelo Mathews off Rangana Herath at 444. The young gun of Bangladesh, Nasir Hossain, joined in next with his captain and they kept on cruising with regular boundaries. Nasir Hossain was the most attacking of the two, he did not spare any lose ball and the 500 of the innings appeared on board in the 154th over. Nasir Hossain reached his fifty three overs later as Mushfiqur Rahim kept on creeping from the other end. Mushfiqur Rahim added a couple of fours in the following overs and became the first Bangladeshi to plunder a double hundred in Test cricket on the first ball of the 168th over. He was finally declared leg before wicket off Nuwan Kulasekara for exact 200 runs three deliveries later from 321 balls with 1 six and 22 fours. 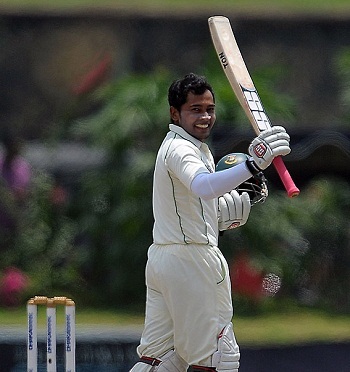 Sohag Gazi appeared in the park next and took the score to 581 with Nasir Hossain in 176.3 overs. 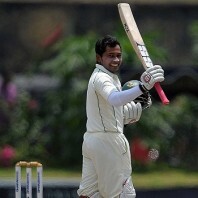 The first was gone for 21 as Nasir Hossain took over and dispatched his maiden Test ton in the 189th over. He was caught by Kumar Sangakkara at midwicket off Tillakaratne Dilshan for 100 scored from 151 balls with 9 fours. The entire Bangladesh team was bowled out for 638 runs in 196 overs by gaining an overall first innings lead of 68 runs. Nuwan Kulasekara, Shaminda Eranga, Rangana Herath and Ajantha Mendis shared two wickets each. Sri Lanka suffered an early blow when Dimuth Karunaratne was caught at fine leg by Abul Hasan off Shahadat Hossain for just three runs as Kumar Sangakkara got together with Tillakaratne Dilshan. The duo consolidated the innings with concentration and reached 48 after 13 overs as Sangakkara was dropped by Mushfiqur Rahim off Sohag Gazi at 13 in the next over. Dilshan was going smooth from his end and reached his 23rd Test fifty on the first ball of the 24th over. The first hundred of the innings was attained in the 26th over as the home side scored 116 with nine wickets in hand whereas Dilshan and Sangakkara were at the crease with 63 and 49 runs respectively. Sri Lanka secured a lead of 48 runs and with one day remaining in the match it looks like the game will end up in a draw.